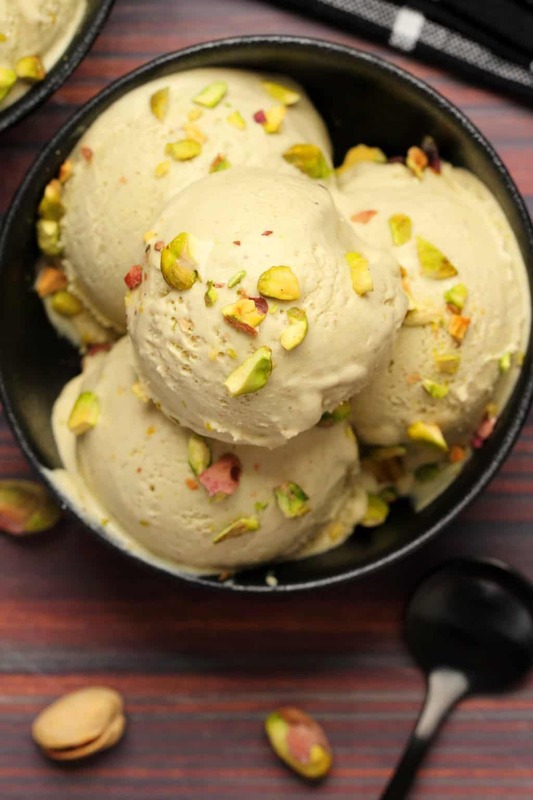 Creamy vegan pistachio ice cream. 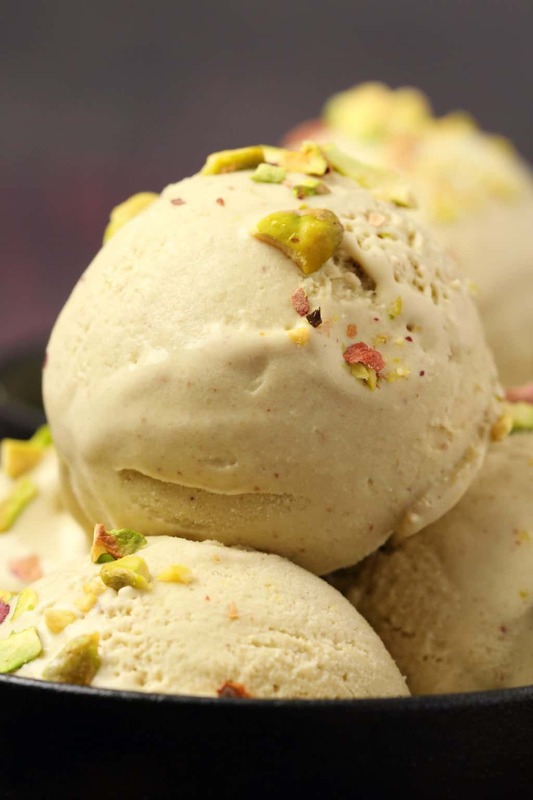 Smooth and wonderfully textured with all the pistachio flavor you can dream of! 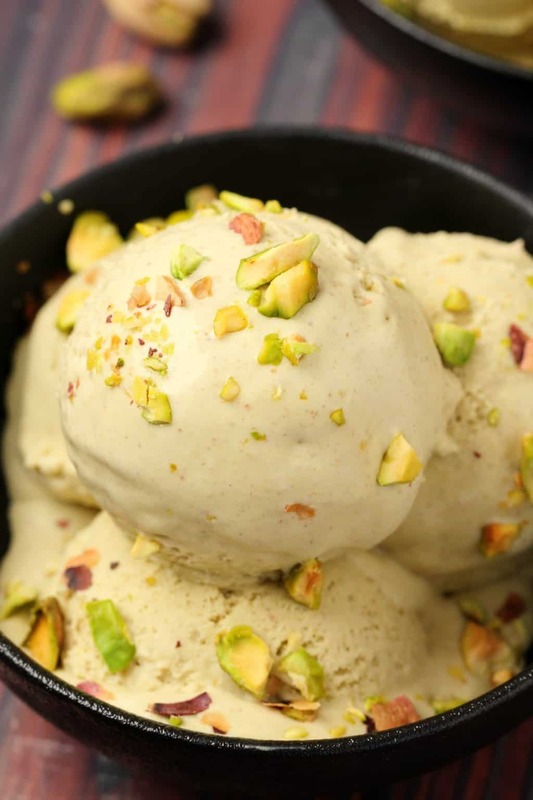 This vegan pistachio ice cream has such a gorgeous color. And I was surprised because when I was first thinking about making it I was wondering if it might require something really green to be added in, like green food coloring or some spirulina or something like that to make it green. Because while pistachio nuts are green, I didn’t know if the color would hold that well once mixed in with all the other stuff. And looking around the web I saw a lot of recipes adding in a little something something for color. Well… it wasn’t needed here. 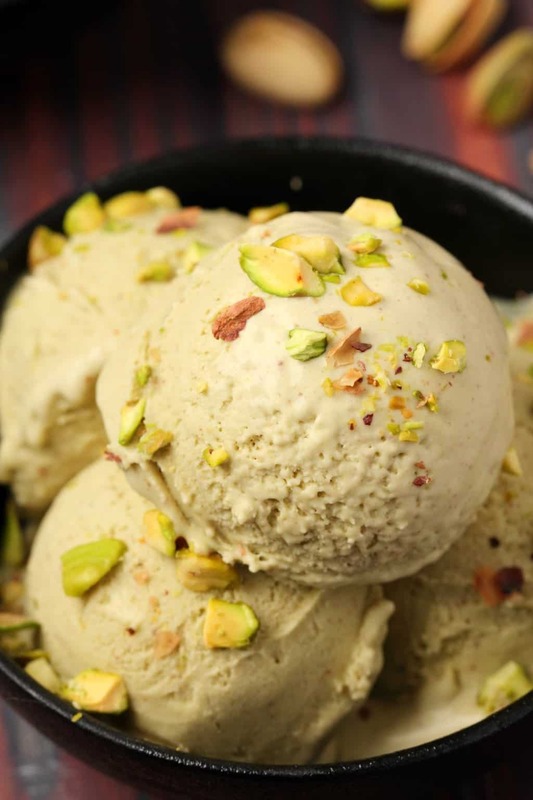 The lovely green of this ice cream comes entirely from the pistachios, nothing extra needed, and it’s a really gorgeous pale green. 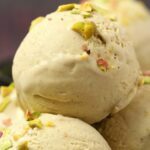 The base of this recipe is the same as our simple vegan coconut ice cream with some ground pistachios blended in. You start off with a mix of coconut milk, coconut cream, sugar and syrup and heat that on the stove until it reaches a simmer. Then you add in some ground pistachios and blend them in with an immersion blender. I struggled to get it smooth enough with my immersion blender, so then I moved it to my regular blender and finished up blending it there. If you want to save time, you can just go straight to your regular blender, because the immersion blender doesn’t work quite as well with getting this as smooth as possible. But if you only have an immersion blender, then don’t worry, it doesn’t have to be all that smooth! Then you transfer the ice cream mix to a container with a lid and place it into the fridge to cool overnight. If you’re in a hurry you can place it into the freezer until it’s chilled, that will only take an hour or two, but just keep an eye on it you don’t want to forget it in there. When your mixture is chilled, the next step is to churn it in your ice cream maker until it reaches soft serve consistency and then smooth it down into a loaf pan, cover with foil and place into the freezer to set. What is great about this ice cream is it doesn’t get so hard that you can barely scoop it until it’s thawed a bit. It maintains a really great scoop-able consistency even straight out the freezer. 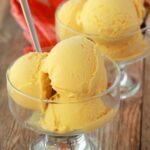 High fat ingredients make the best ice cream. So this is why we use canned coconut milk and canned coconut cream in this ice cream. 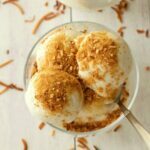 If I am walking in the supermarket and looking for a brand of coconut milk and coconut cream to use for making ice cream I check the nutritional information and the one with the highest calorie and fat content is going to win. 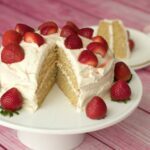 So definitely don’t make this with low fat ingredients or light coconut milk, it really won’t be the same. I used salted, shelled pistachios. Actually we had to shell them by hand because we couldn’t get ones that were already shelled. If you use unsalted pistachios, then add a little salt to the recipe when blending, 1/2 tsp should be fine. 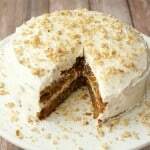 But the saltiness really works wonderfully with the sweet creamy flavors in this recipe. The shelled pistachios were ground to crumbles in the food processor. In theory you could skip that step since you’re going to be blending them into the ice cream mix anyway, but we preferred to grind them up first to make things as easy as possible. If all you have is an immersion blender then that is an essential step. 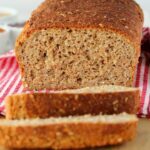 Keep stored in the freezer and ideally consume within the first week for the best taste results. 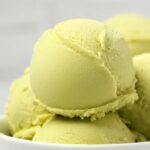 Our vegan avocado ice cream is another gorgeously green ice cream as is our vegan mint chocolate chip ice cream. 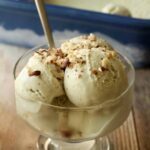 Our vegan vanilla ice cream recipe is the recipe that started us off on our passion for making vegan ice cream recipes and our vegan peanut butter ice cream and vegan chocolate ice cream are both super rich and decadent. Our fruity flavors vegan strawberry ice cream and vegan mango ice cream are a blend of fresh fruit with perfectly textured creamy ice cream! 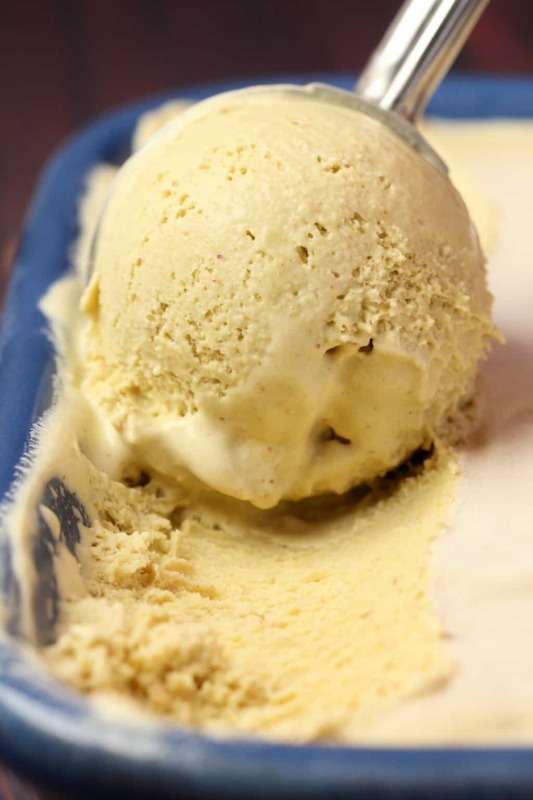 If you don’t have an ice cream maker then definitely check out our peanut butter banana ice cream, made in a food processor, and our no-churn vegan cookies and cream ice cream. 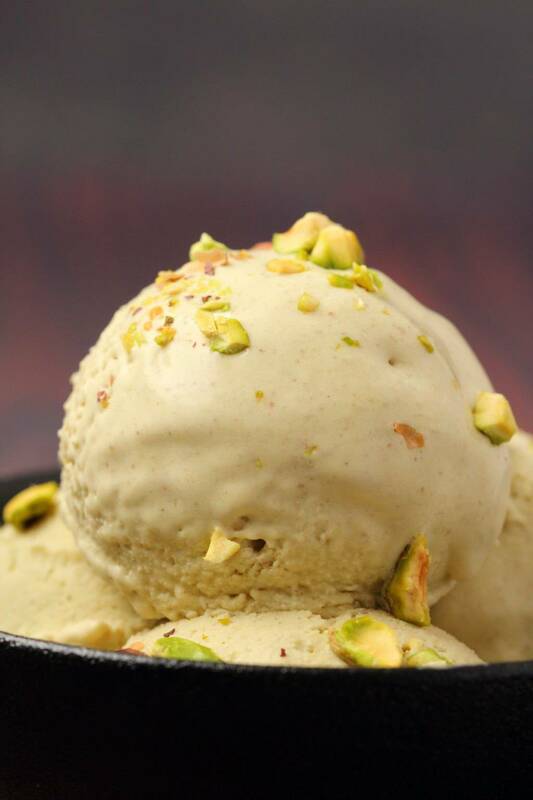 So let us know what you think of this vegan pistachio ice cream in the comments and please rate the recipe too. Thanks! For more delicious recipes sign up to our email list, we’ll send you a gorgeous (and free) recipe ebook with 10 delicious vegan dinner recipes and you’ll be the first to know when new recipes are posted to the blog. 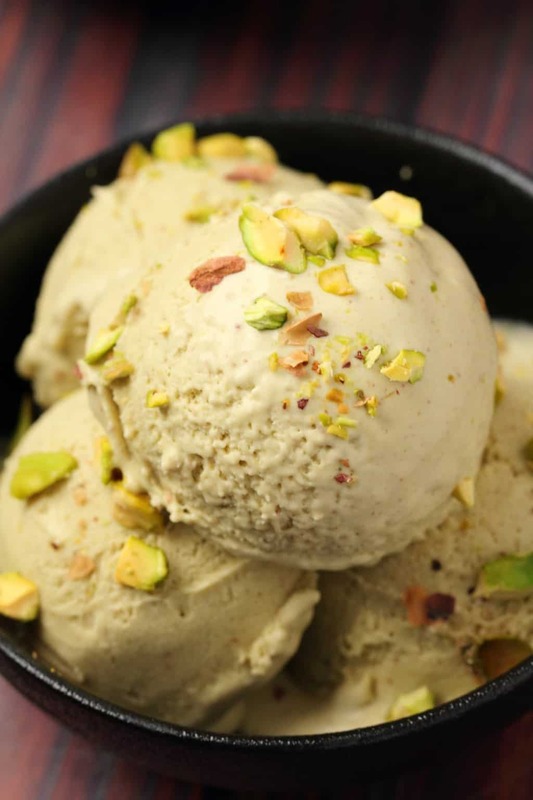 Creamy and beautifully green vegan pistachio ice cream. 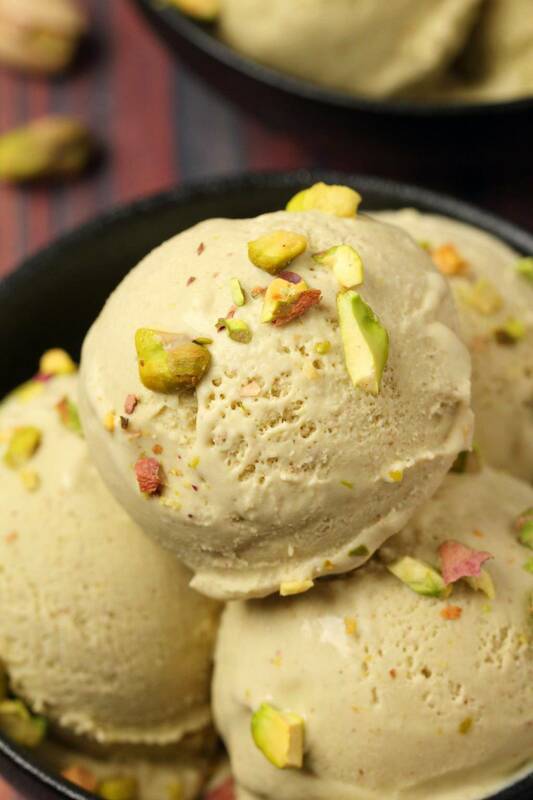 Smooth and wonderfully textured with all the pistachio flavor you can dream of! At least the night before you want to make ice cream, make sure to place the bowl of your ice cream maker into the freezer to freeze. 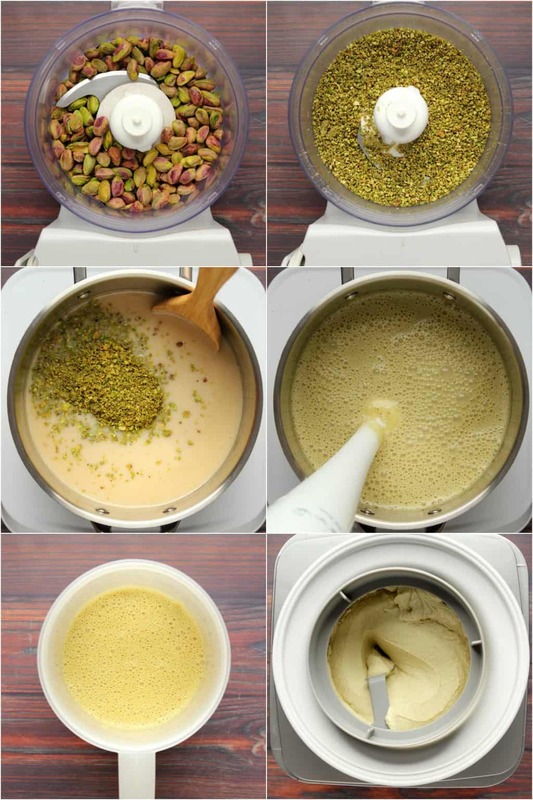 When you’re ready to make your ice cream, add the pistachios to a food processor and process into crumbles. Then add the coconut cream, coconut milk, sugar and syrup to a pot and bring to a simmer, stirring constantly. As soon as it reaches a simmer, remove from the heat and add in the pistachios crumbles. 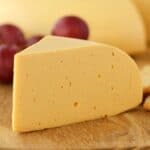 Pour it out into a container with a lid and either refrigerate overnight to chill, or if you’re in a hurry, you can place it into the freezer to chill for an hour or two until cold. Just don’t forget it in there! 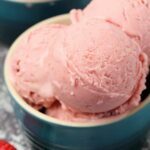 When the mixture is chilled, pour it out into your ice cream maker and churn according to manufacturer instructions until it reaches soft serve consistency, this can take 20-45 minutes depending on your ice cream maker. 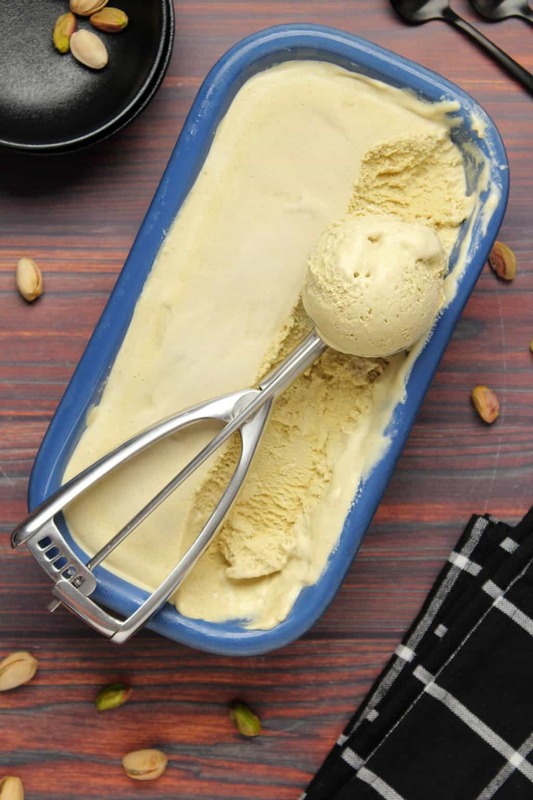 Transfer the ice cream to a loaf pan and smooth down with the back of a spoon. Cover and freeze until set. *You can switch the maple syrup for a different kind of syrup. *If your pistachios are unsalted then add a 1/2 tsp salt to the recipe. *If you don’t have an immersion blender, then just use the regular blender only. *It won’t be entirely smooth, no matter how much you blend it, and this is okay. You are just going for as smooth as possible, which is not all the way smooth. *Prep time does not include the time spent chilling or setting in the freezer. I don’t have a ice-cream maker is there anyway of making it without? 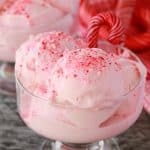 Hi Jennifer, the churning incorporates air which makes the ice cream end up more ‘light and fluffy’ so if you have a mixer, you can beat the mixture and then place it into the freezer for a couple of hours and then bring it out and beat it again. I don’t know if a Vitamix will have the same effect, so an electric mixer will work best if you have one. This looks just so delectable! Your ice cream is just divine!